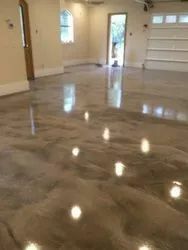 Applying different type of Epoxy / PU based coating to industrial floor and wall surface for getting dust proof, aesthetic, chemical and abrasion resistant. For interior and non-critical weathering applications where chemical, electrical, or possible livestock ingestion environments are encountered. Typical applications are on lab furniture, water/well pumps, certain engine components, childrens' toys, certain electrical components and livestock gates/fence posts.